Confession time. So I did this crazy thing on Monday. I drove past a woman hitching on Avimore, and felt God say, with a bit of a woosh in my heart, turn round and pick her up. Um no God, I don’t do hitch-hikers. I’m a woman. I’m 5 foot one. I don’t know jiu-jitsu. So, I swung around, u-turned and picked her up. Turned out she was heading only about 5 minutes away and while I had only intended to take her to the end of avimore… I took her to where she was going. We chatted on the way, as one does. But I knew why I had. It wasn’t a huge conversation. We drove for only about 5 minutes, I dropped her off. But I know that God was using that moment to speak to this young woman. If anything, she knows that He saw and cared. All the time God is speaking. To me, to you. He wants to speak TO you and THROUGH you. God has a history of speaking to us THROUGH people. He reveals Himself as the God of Abraham, Isaac and Jacob. People. Not just heroes or giants of the faith but real flesh and blood people. People who were husbands, fathers, friends, neighbours, workers, employers. Today He speaks through people. He is the God of Peter, of Oliver, of Jennifer, of Claire. And people learn about God and see Him THROUGH people like you and me. We live in a world where there are so many voices coming at us from every direction. Even our own voice doesn’t stop. Everything and everyone competes for our attention and ear space. But not everything speaking is good. There are voices with an agenda to kill, steal and destroy. And the only one that speaks perfectly is God. So how do we hear His voice more clearly? It’s important in this sea of voices to hear clearly from God. It’s important to hear HIS heart and His guidance. God’s Words will change your future. God’s Words will change a nation. God’s Words will define our life. God’s Words will define our marriage, our children, our identity, our dreams, our destiny. We need to hear His voice. God is speaking. Are we listening? Is His voice the loudest? In a world of noise how do we hear His voice with a greater clarity? 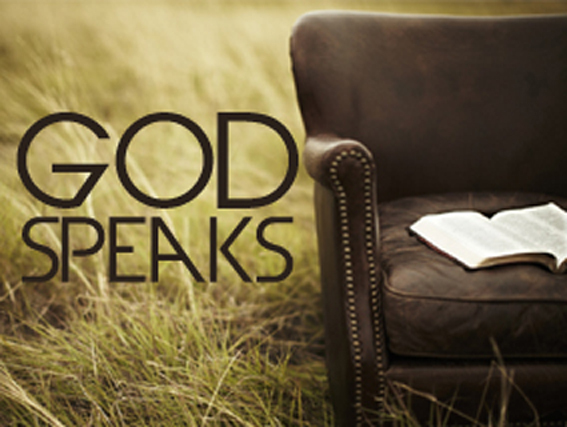 Tonight we’re going to explore the way that God speaks THROUGH people. There are two types, or categories tonight of people that God will speak to you through that we are going to look at tonight. There are lots of other ways God will use people, through prophetic words a church or housegroup context, or though songs or books or podcasts but tonight we’re going to break it down to just two types of voices.. Intentional Voices are the people you’re intentionally in relationship with. That includes your pastor, your housegroup leader, your mentor, your best friend, your friend at church. These are the people in your world that you interact with in a more regular relational form. Random voices are the people who might be completely left field randoms – like I was for the girl hitching the other day… or they might be people you kinda know. Some of the people here at church may be your randoms. God aligns you with people in your life for divine conversation. He will use the people in your life to speak TO you and He will speak THROUGH you to the people in your life. It matters who you listen to. These are the people you learn and listen to. People who have a regular voice in your life, the people you INVITE in and give permission to speak into your life. Think how differently some of these scenarios might have played out if these biblical people had listened to the right voices instead of the wrong ones…. God will use the regular people you have given permission to speak into your life to give you life wisdom, direction and confirmation. It doesn’t have to be an uber spiritual moment resonating with spiritual power and goosebumps to be a God moment and God speaking through someone. Sometimes God speaks through what is referred to as “common wisdom” – when He uses someone’s life story and natural wisdom to give you advise and practical revelation, to help you on your journey. Don’t discount that. Just because that revelation comes over a cup of coffee, or at the breakfast table, or with the person you sit with at church, doesn’t mean it’s any less special or awesome. Sometimes that sky writing moment is staring us in the face – and it looks like our best friend, or our housegroup leader, or our pastor, or our mum. Learn to LOOK and LISTEN for God speaking in this way. Another powerful example and a more direct conversation is when Nathan, the prophet, came and spoke to David after he slept with Bathsheba in 2 Samuel 12. We can see Moses’ father using his God given wisdom and position as a big person in Moses life to speak life giving guidance and we can see Nathan the prophet speaking a hard challenge. Both times I think the WHO the message came through was a relevant factor in the message being received loud and clear. As we go through tonight I want you to keep these 2 examples in mind and see how they play out and the different elements that made Jethro and Nathan good speakers and Moses and David good listeners. It’s good to have big people in your life – people who you trust, who love God and who love you. People who will speak the truth and give you their honest and their prayerful words. You might formalise the connection and ask them to be a mentor in your life, or just have them as a friend you know who you can trust. 1. Fruit First: Pick people with good life experience, fruity people. Choose people that are further on the pages of life than you… someone that knows about marriage, someone that knows about buying a house, someone that knows about raising kids… we learn through life experience and through doing it. Choose people who have done what you want to do and learn the lessons from their life, instead of having to go the hard way and make the mistakes yourself. Learn their life lessons. 3. Heart Matters; The person you listen to should have a heart-felt concern for you, your physical and emotional well-being, for your relationship with God and for the Kingdom of God. AKA – they care about you, but most importantly they point you to Jesus. And the thing is that we are more likely to listen when we know we’re loved. I am usually more likely to hear something that God is saying when He says it through Annika, that I would through someone random in my life. I have given her permission to speak into my life because I know she loves me. You know God doesn’t only say the easy thing – and so the people whom God is speaking through wont only say the easy thing. Don’t only surround yourself with people who validate and endorse everything you do, choose people who love you and will say that hard thing. Some of the people who love you the most will say the things you want to hear the least. But if you trust their heart, you’ll trust their words. 4. Hard Matters: We often get all buzzy about mentoring and accountability until they say something that we disagree with. But its only real accountability if you do what they say, even when you don’t want to do it. Many of you will be able to identify those people in your life. People you are open to. Be a good listener. Make time to listen. If you don’t have someone that you would consider a big person then talk to your housegroup leader, talk to someone maybe a bit older that you consider wise. Take them out for coffee. Chat with them after church. But God also speaks through other more random people in our life. However and whoever He speaks through, here are some things to watch for and be aware of when listening for God’s voice THROUGH others. 1. Vantage Point: Different people have a different perspective on our life than we do and sometimes we are too close, or too emotional about a circumstance and it takes someone else to point out the missing link and right course of action. Even when we think we are in the centre of God’s will, we could be missing something. I remember on my first date with Tony we went to the movies… and I burst into tears in the queue to buy our tickets. Great way to make a first impression, not. I wanted to quit my job, desperately. He talked me off the cliff edge and gave me a different vantage point that helped me hear more clearly what God was saying. I was reading a great book called PLATFORM by Michael Hyatt last week and he uses and illustration that I think fits here. He and his wife went to lovely Maui and went snorkelling. As they paddled about in the lagoon, facing down in the water, they were mesmerized by the aquatic life teeming just a few feet below them. They saw brightly coloured fish, gently swaying plants, and, of course, the coral reef itself—alive with activity. It was truly a wow experience. Though at some point, Michael decided to lift his head out of the water and look around. Caught in a rip-tide, they had drifted more than a mile out to sea. The shoreline looked impossibly far away. They had boogie boards with them and grabbed them and swam and swam. They swam for more than an hour. Sometimes someone else can look at our life and be the lifeguard. You’re drifting! You’re in dangerous waters. All we see is the fish and the coral and the peaceful waters of our today – but someone else can look in and speak to the reality and potential danger of our situation. Have you got someone who can be a lifeguard for you – who can look at your life from another vantage point and give you wisdom and guidance? 2. Word Words vs World Words: When God speaks through someone it will line up with The Word of God. It will not contradict the Bible. This is why it is important to make it a regular rhythm of your life to read the Word, so that you will know what it actually says. So that when someone gives you some world words, words that sound good, that might be well intentioned but push you away from God, away from His purposes, away from His ways, that you’ll recognise it and back away…. The Holy Spirit will never act in contradiction to the written Word of God. He is the One who inspired the Bible in the first place. Now this doesn’t mean that when someone is giving us guidance or encouragement from God that it has to be in scripture, because thatith would be-th a bitith crazyth… but it does mean that needs to point to Jesus and His ways. I Jn. 4:1-3: “Beloved, do not believe every spirit, but test the spirits, whether they are of God; because many false prophets have gone out into the world. By this you know the Spirit of God: Every spirit that confesses that Jesus Christ has come in the flesh is of God, and every spirit that does not confess that Jesus Christ has come in the flesh is not of God. 3. Echo Echo Echo: Sometimes what someone says will ECHO what God is saying. It confirms and reinforces what God has been saying through many different ways to you., it fits the theme of what He has been saying. I love it when this happens. You turn on the radio, and it’s a song about THAT thing. You check facebook and there is a status about THAT thing. You open your bible and there is THAT thing again. You chat to someone in the line for coffee after church and they encourage you about THAT thing. You talk to your best friend and yip, it’s THAT thing again. 4. Receive or Leave: sometimes someone will say something and put a God spin on it. But you get to chose what you hear and what you receive. Check it with The Word of God. Check it with the themes of what God is saying to you. If it’s totally left field then you can leave it. God won’t be offended and will keep on speaking. If you’re bothered by what someone has said then talk about it with a big person in your life. Talk to your housegroup leader, your friend. Pray about it. You can choose to receive or leave. And just a freebie here: don’t pressure people into receiving what you say. Thus sayith the Lord isn’t cool anymore. 5. The Nike Principal: If God uses someone to speak into your life, obey. Don’t you just love that there are no limits with God. God can use anyone, at anytime, in any way, for anything. And that anyone, includes you. A few weeks ago I was so privileged to be a random voice. It was a Sunday night, here at The River, and I was massively enjoying the worship and then I felt God distract my attention to Kay, who was standing behind me and to the right, in her own space, worshipping God. I looked over and saw in my imagination, God hugging her. Jesus came up beside her and gave her a hug. So, I got my brave pants on and went up to her and introduced myself, because I was a random, and asked if I could pray for her. She graciously said yes, so I told her what I saw. Her eyes went wide and glistening and she told me what she had prayed. During the worship she had being praying “God if you’re real, give me a hug” And then up I come, a random, telling her that God was hugging her. Now that was a GOOSEBUMPS moment. Just the other day I was thinking of a friend… she just popped into my mind. So I texted her. I reminded her that God completes what He starts (Phil 1:6) and that He is the dream giver and the dream fulfiller. She texted back and replied how she was feeling really low and had being just asking God for someone to encourage her. And then beep beep beep. I thought my encouragement was random, but God had a specific message and new hope to give her. She asked how did I know? I didn’t, but God did. She was on HIS heart. When we are open to God He can speak THROUGH us. We may think that what we have to say isn’t very much. Sometimes when I am aware of God speaking THROUGH me I can feel that my words are so insignificant. I can feel like that little boy in a field of people one day, giving Jesus my lunch. You can read about it in John 6:1-14. There were nearly 20000 people there, give or take – what could one little lunch do. Yet that one lunch fed all those people and had 12 baskets left over, which meant that when that food was distributed it could feed a whole heap more. One little lunch. What is in your lunch-box? Are you willing to give it to Jesus and let Him use you? Who knows the affect of your words on one person… and then that person in their world? Encourage a person and they’ll go out with courage into their world. Give grace to a person and that will ripple in their circle of influence. Speak words right from God’s heart and it will have potentially eternal effects, not only in their life but in the lives of those they do life with. I want to encourage you to be bold and to step out when you feel maybe God is talking. And it is a maybe feel. Sometimes when I step out I’m like “God you better be in this! More words please!” Philippa came and talked to our SAS crew this week about etiquette and manners – as we’re learning to successfully present ourselves and connect with the world around us – and she talked about meeting new people and told us to DO IT AFRAID. Let’s do it afraid and see the amazing things God does. Give your lunch. There are also those moments where we’ll hear a song… read a book… see a facebook status or a tweet… listen to a podcast… and we know that at just that moment that was God speaking personally to us – THROUGH what that other person has said, done, written or sung. Take note of those moments. Listen. God is speaking. He is speaking because He loves you and you are His child. great teaching indeed. I frequently feel like I’m talking drivel then someone says that something I’ve said has either helped them or encouraged them or given them pause to think. God uses us even when we think it’s not possible. One thing this teaching has highlighted to me though, I really want to seek out a mentor, mentors. I used to have one about 10 or more years back and she spoke a lot into my life. As I move into another phase of life (50 is just round the corner), I feel the need to have a mentor for this new phase. Claire, God has given you the gifts of writing and teaching. I’m glad that you follow and chase after God. thanks so much mary! your words mean a lot to me! have a great day! Great message, spot on. God will not speak over our noise, but is waitng to speak into us, and through us. LOVE! thank you Claire.